CUPE BC is proud to not only support this year’s conference as a platinum sponsor, which includes facilitating a conference session, having a booth at the trade show and addressing conference participants at the closing plenary, but also to support CUPE BC library committee members attending the conference. Ranalletta says that this year the committee decided to focus their conference session around library workers as natural champions of democracy – exploring how library workers are inherent champions for democracy, equity, diversity, access to information and literacy. The session started with a panel discussion hosted by three CUPE library workers, Kathy Boyce (CUPE 23), Marc Comeau (CUPE 401), and Fiona Brady-Lenfesty (CUPE 3338), who shared their experiences as advocates for their community organizations and suggested ways library workers and allies can strengthen the understanding of library services in our communities as natural champions for democracy. Following the panel discussion there was an interactive dialogue by session participants where everyone got a change to learn about the interesting work their colleagues do in their communities as well as a chance to discuss what library workers and community allies can do to advocate for things we value most. Ensuring that libraries are a place where patrons feel safe and included. The need for libraries to be inclusive and to continue to break down barriers for all users. Library workers empowering others to advocate passionately for themselves. Outreach outside of traditional library spaces, and going to users so they have the skills and information they need to effectively navigate libraries. The important mandate libraries and library workers have to continue to allow access to information to all. Tiaré Lani Kela Jung from Drawing Change was also in attendance to provide live visual notetaking of the discussion so delegates could take away a visual summary of the session. This year several CUPE members also took home BCLA awards and facilitated conference sessions. Kyla Epstein, CUPE 1004 member and chair of the Vancouver Public Library Board, was the recipient of the BCLTA’s 2018 Super Trustee award, and Dr. Tess Prendergrast, CUPE 391 member, was the recipient of BCLA’s Young Adults and Children’s Services award. Sarah Bjorknas from CUPE 23 presented at What Labour wants, What Management Wants, and Fatima Ferriera and Delia Felipescu from CUPE 410 presented at BEcoming the Village: GVPL and the Victoria Native Friendship Centre and the Community Inspired Approach to Reconciliation. 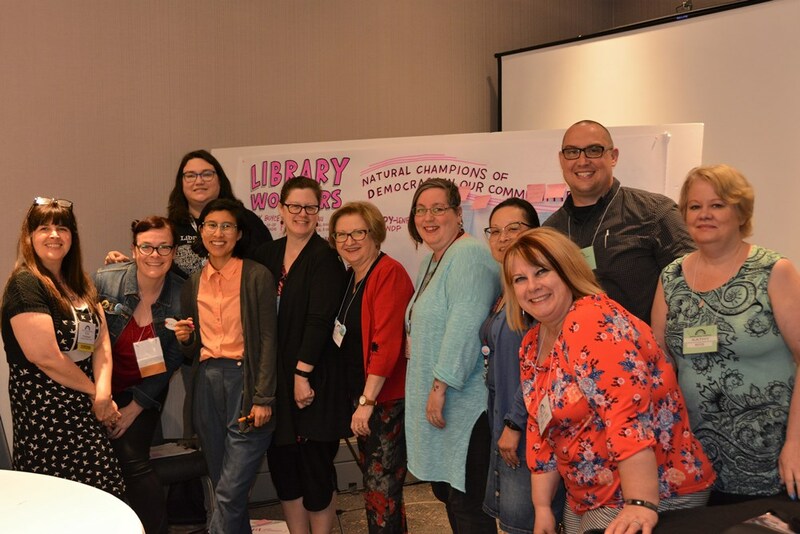 You can learn more about the CUPE BC library committee here. You will also find the committee’s recommend reading and film lists and the library sector health and safety survey report at that link. If you are a library worker and interested in becoming a CUPE member get in touch with us here.